Kathryn and Chas' wedding had two ceremonies! 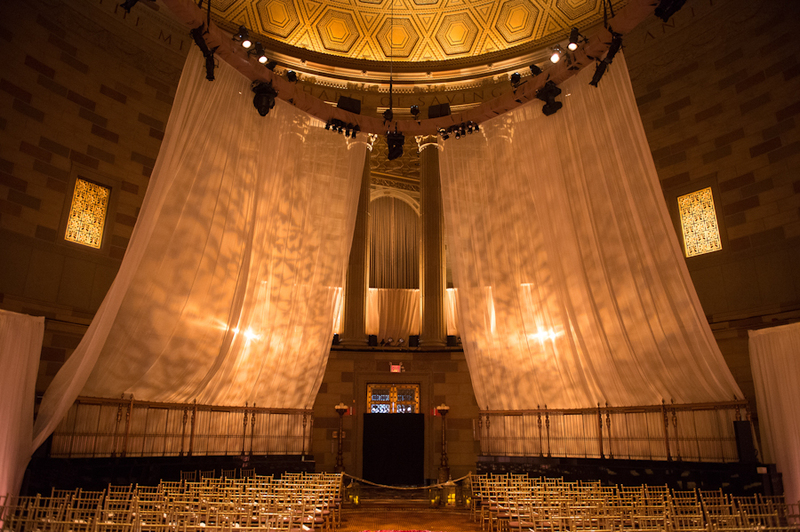 With both ceremonies and dinner taking place in the same room at Gotham Hall, it took a team of the best creative professionals to execute it all so smoothly and beautifully. 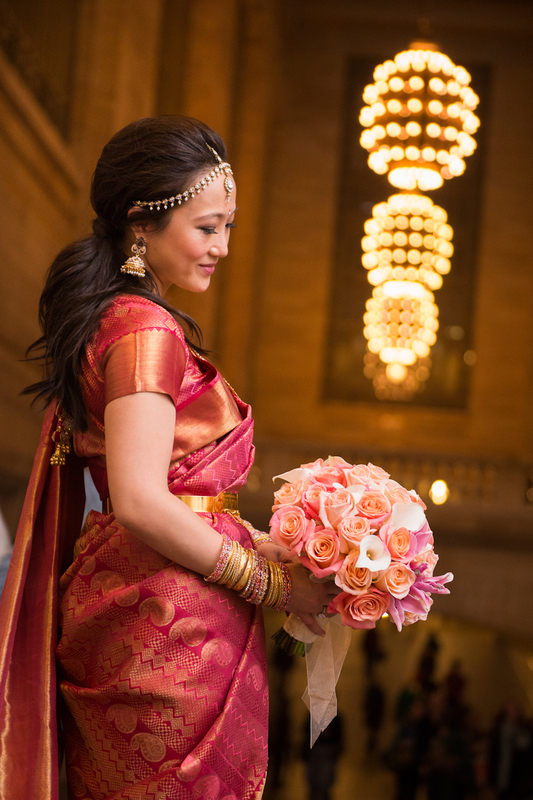 Coming from very different backgrounds, it was important to the couple to pay proper tribute to their Indian and Chinese cultures and religions. We started the day with their Hindu ceremony. 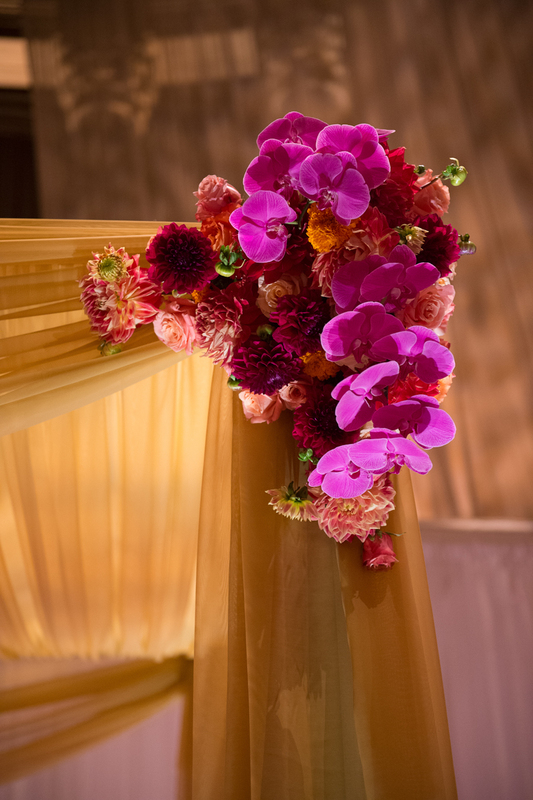 By Yena Designs created a striking gold chiffon mandap with bright pops of orange dahlia and magenta phalaenopsis orchids draped elegantly from the corners. The aisle was artfully decorated with petals inspired by rangoli designs. The bride was so happy when she saw the room, she shed a tear! With the conclusion of the first ceremony, guests were ushered upstairs for coffee, tea and dessert, as the room was changed for the Catholic ceremony. The floral palette was a clean white with a few subtle touches of pink. To honour Kathryn's grandmother, Yena placed a few pale pink lilies, her favourite flower, into her bouquet. One of my favourite personal touches was the Indian rangoli vine surrounding the Chinese "double happiness" character. Both elements were used separately on the invitation suite, but on the wedding day they were combined and used on the menus. I loved the symbolism of bringing both families together that day. Guests dined under the grand dome at tables dripping with orchids from Yena. 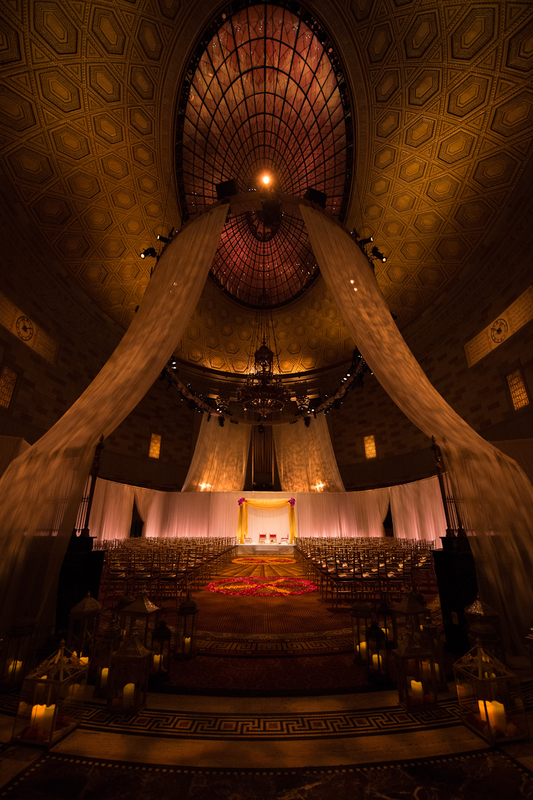 With romantic draping from Dazian and dramatic lighting from Bentley Meeker, the room was breathtaking! They partied the night away to the incredible sounds of the Blaire Reinhard Band. I am so proud of how everything came together for Kathryn and Chas that day and could not have done it without the amazing team involved! The Foundry is one of my favourite venues and it is always a delight when we get to plan a wedding there. I met Hadley and Pree shortly before their move from New York to Paris. Hadley wanted to work with a NYC based wedding planner as she would be planning her special day from Paris. 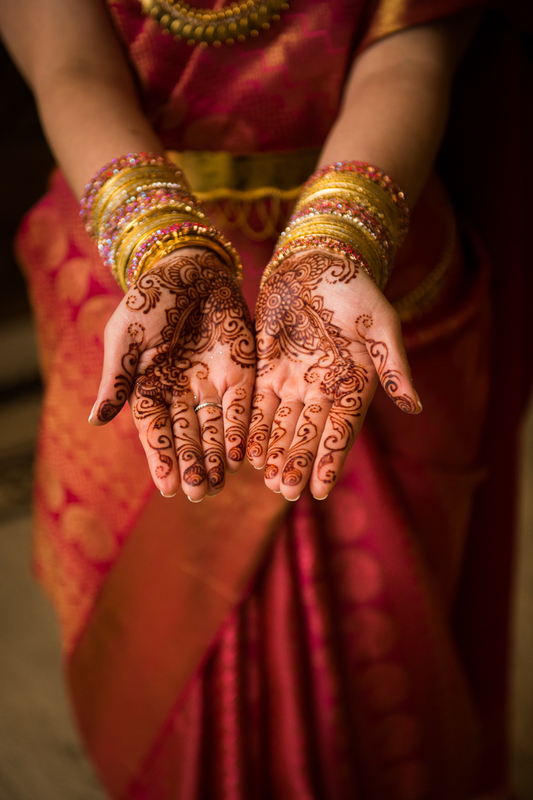 I had such fun working with them to incorporate special details into their day to reflect her family being from the South and his family being from India. The exposed brick and unique metal work always makes for an interesting background at The Foundry. The black bridesmaid dresses and tuxedos made for such elegant portraits. Isn't a wedding a great reason to get all dressed up? 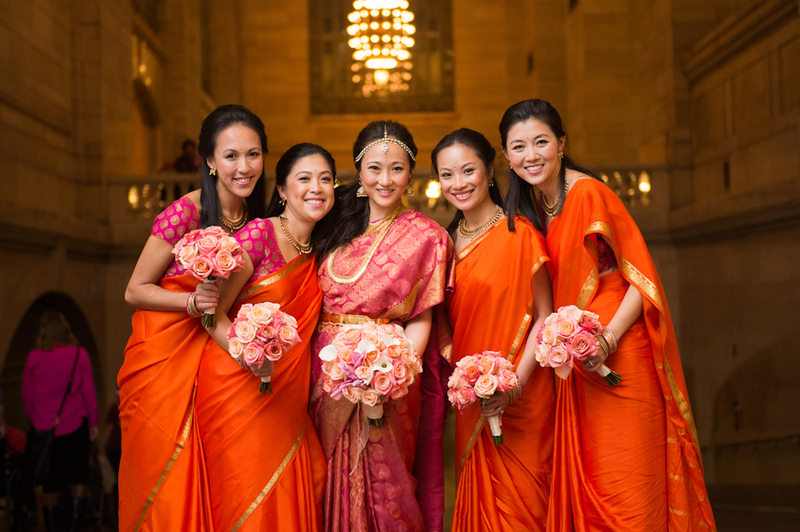 It was such a sweet ceremony incorporating both American vows and Hindu vows. 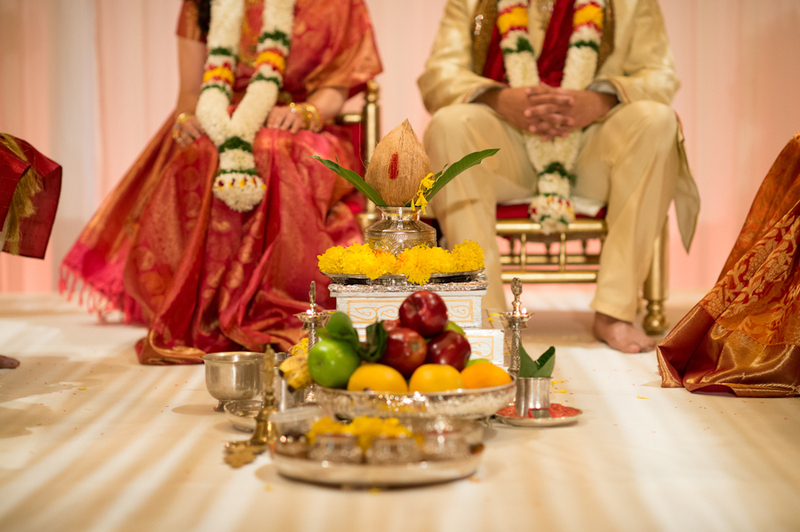 At the end of the ceremony, Hadley and Pree exchanged flower garlands (varmala or jaimala), which signifies mutual acceptance of both Bride and Groom to each other as future husband and wife. Long tables in the main dining room work so beautifully with the space. We used grey linens (one of my favourite colours as exhibited by my website) and the flowers were a mixture of ivory and blush. The wooden cross back bentwood chairs, votives and cafe lights brought a welcoming warmth to the room. Sonnier & Castle did a great job creating a menu with both Indian and Southern flavours. Their Indian influenced hors d'oeuvres included bhel in phyllo dough cups, paneer chutney pakora and murgh hariyali. The American dinner included Jerusalem Artichoke Velouté with Chanterelle Custard and Walnut Bread Tuile and Braised Beef Short Rib with Tomato, Swiss Chard, Rosemary Polenta, Beef Mustarda. Guests were raving about the food that night. Guests were invited to write their words of advice on note cards for Hadley and Pree in their married life together. The banana cakes with cream cheese frosting were from one of the couple's favourite bakeries in NY Billy's Bakery. Their dog did not get to join the festivities that day, but was given a place of honour as a cake topper. So cute! Marianne and Collin were married on a beautiful day at Linden Terrace Fort Tryon Park. Fashion changes so much that let's face it, it is highly unlikely that you will end up wearing your Mother or your Grandmother's gown on your wedding day. A lovely way to honour them is to incorporate some part of their wedding fashion into your own. Marianne did this in such a sweet way by using the buttons from her Grandma's wedding gloves and sewing these to the back of her gown. This wedding we planned in Hong Kong was a beautiful blend of cultures with a Chinese Bride and a Kenyan Groom. 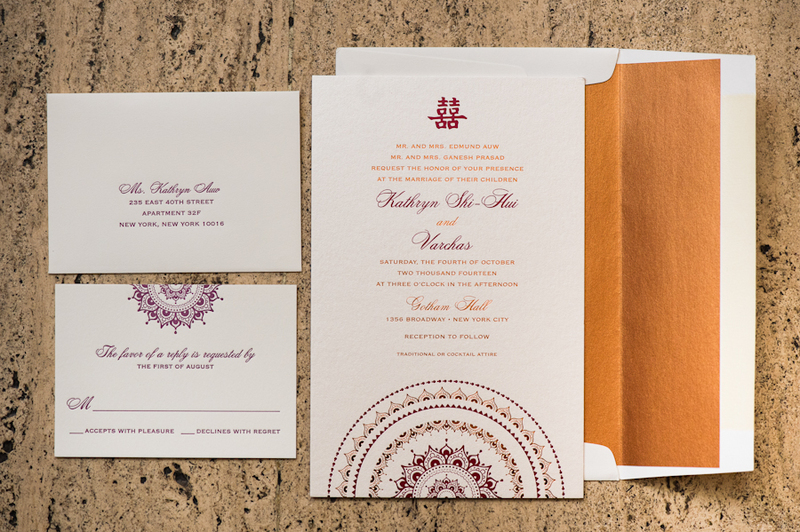 One of the Bride’s best friends from college designed the letterpress invitations, guestbook and thank you cards. The folded invitation was worded in both English and Chinese. Using words from I Corinthians 13:1-13, she created the Chinese word “double happiness” in letterpress for the guestbook and thank you cards. The “double happiness” motif is often found as a decorative element in Chinese weddings. I love the blend of languages in these creative ways by Dodol & Tamago. We worked on a Chinese-Kenyan wedding last December in Hong Kong. 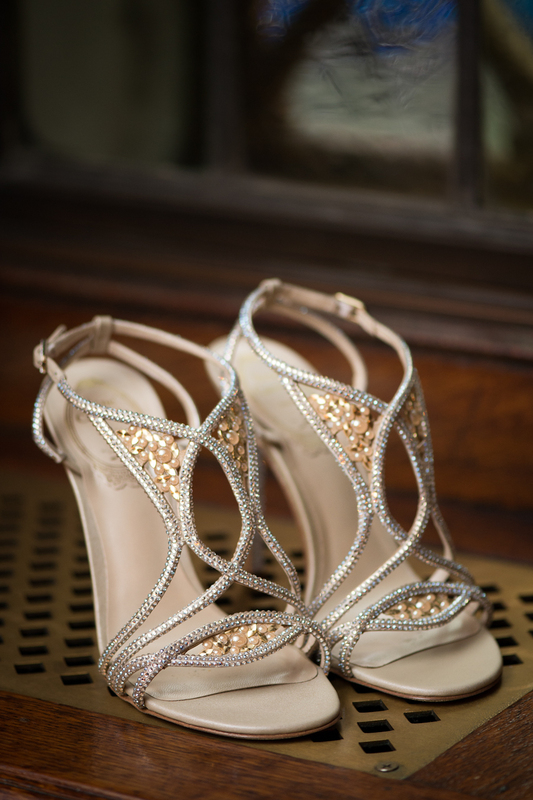 The Bride wore a beautiful kwa with incredible detailing (pictured above). A dragon and a phoenix were embroidered in gold onto a red cloth. The morning of the wedding the Groom and his Groomsmen travelled to the Bride's home for the always hilarious door games. The Bride was hidden away in one of the rooms in the house. The Groom and his Groomsmen had to pass a series of tests set by the Bridesmaids before the Groom could see his Bride. These sometimes involve physical tests and eating weird things, but more often than not, they are asked to do something embarrassing. (Note to the Groomsmen - be nice to the Bridesmaids). The Groomsmen also had to give the Bridesmaids red packets (lai see or hong bao) with money. The amount of money included the number 9, as 9 in Chinese represents eternity. The tea ceremony followed with the Bride and Groom serving tea to their families as a sign of respect. This usually starts with parents or grandparents and is followed by uncles and aunts and then elder siblings and cousins. In traditional families, the Bride and Groom kneel on cushions to serve the tea. In modern families the Bride and Groom serve tea while standing. Family members gave the Bride and Groom red packets and gold jewelry in return. The Chinese banquet involved 12 courses! The courses at a formal dinner are served sequentially, like a tasting dinner. Usually a delicious selection of meat, seafood and vegetables are served, ending with noodles or rice. The thought is that you should be so full by the last few courses that you cannot finish your noodles or rice. It is better manners to leave some, so your hosts know that you have been well fed. (This part I personally find very difficult....I love my rice and noodles).